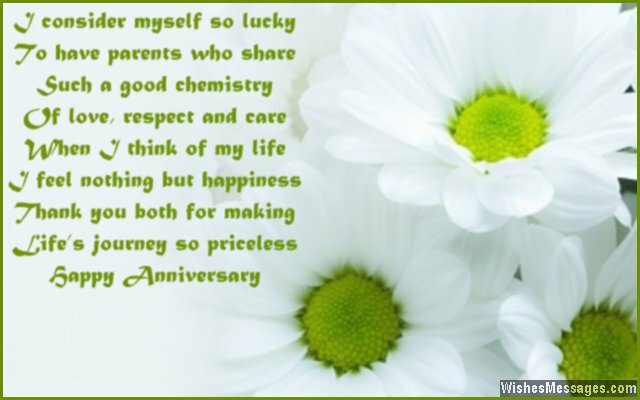 Anniversary Poems for Parents: Wedding anniversaries are not just a celebration for the married couple, but for their children too. Your mom and dad’s marriage anniversary is your chance to spoil them with wishes, gifts and warm hugs. Start the day by giving them a handmade greeting card. Such a sweet gesture will instantly put a big smile on their faces. Spend the rest of the day tagging both of them on Facebook, Twitter and Pinterest in funny posts heart-warming messages and cute quotes about love, marriage and life. Your parents work hard all year round to pay the mortgage, bills and your expenses – all this while making sure that your life remains as smooth as possible. As a loving daughter or son, show them that you appreciate their efforts. Make their anniversary celebration a day to remember.